In fact, I used to have a whole ritual around it. I had a guy in Colorado who would custom make leather journals with handmade papers for me. And I would light candles. And it would be like a bubble bath for my soul...haha. One thing led to another and my journaling tapered off. Then when I started this blog and wrote six days a week, I told myself that this blog was my journal. And in a way it is. I talk about my feelings and whatnot. But there's a lot that goes in my life that I can't share here, whether for professional or personal reasons. And it's stuff I need to get out of me. So I started up a new journal this week. Journaling has always been a sacred process for me. It's where I think through feelings I'm having. Work through issues in my life. Acknowledge things about myself that are hard to acknowledge. And, for a couple of years, it was where I worked on my descriptive writing skills, as well as my "getting inspiration from nature" skills while meditating at sunrise by the river. I had forgotten just how sacred a process all of that was, in fact. And it's clear I'm not the only who feels that way about journaling. 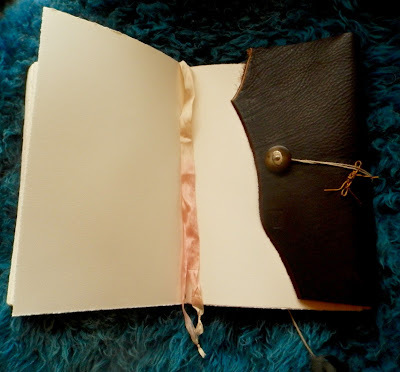 A few years ago a friend of mine announced that she had burned all her old journals and felt a great release from doing it. Of course, pretty much everyone rushed in and said "no, don't do it!" I thought a lot about this and made a post that I was thinking about it. Nearly everyone said "no, don't do it!" to me, too. Anyway, all of this is part of a growing restlessness within me. I recently joined a book club and I don't read, for example. I have no idea what I'm thinking...haha. I just know I need something more than work, blogs, dogs, TV and tarot to think about. I like all those things, but there are other parts of me that are languishing, so I'm beginning to feel those things are walls closing around me, holding me hostage. Actually, the truth is, I've felt that for a while, but never quite realized it in so many words. In a way, I was doing "OK enough" in that prison. That's sad to say, but it's honest. It's just one of the many areas I've come across in my lifetime where I have settled for something "not miserable" instead of insisting on something truly worthy of my attention. And, consequently, this settling has led over and over again to the painful bleeding of both my joy and my potential. Not that journaling can fix that. But it will help. If for no other reason than to keep me from avoiding the fears that keep me in my self-imposed prison. The shift from blessing to curse in our routines, beliefs and actions is so incredibly subtle that we don't see it happening, usually until we've been disenchanted for some time. Sometimes needed change is forced upon us and sometimes we have to impose it upon ourselves. Either way the best way to handle it is to move forward with as much grace as possible, knowing we'll eventually land someplace better.